I am teaching English at a high school in a different part of Budapest. To get there from the Central European University (CEU) I take a train with stations that are decorated with orange and red interiors. The other day, along with one of the officially employed teachers, I suggested that we read “The Old Man at the Bridge” — a short story by Ernest Hemingway. (I borrowed a copy of this story. It appears in a bilingual English-Hungarian edition of a book that is fragile and taped together). In the story, the narrator, a young man at war in Spain, stumbles across an old man. The old man speaks of his hometown, San Carlos, and how he was forced to leave behind his animals — two goats, a cat, four pairs of pigeons. The narrator asks the man: “What politics have you?” and the man replies, “I am without politics […] I am seventy-six years old. I have come twelve kilometers now and I think now I can go no further.” [*1] I had wanted to discuss this point about politics with the students, but we ran out of time, mostly because of my drawn-out and rather embarrassing failure to define, as a native English speaker, the word ‘pontoon’ and my subsequent failure to adequately describe ‘steel-rimmed spectacles’. 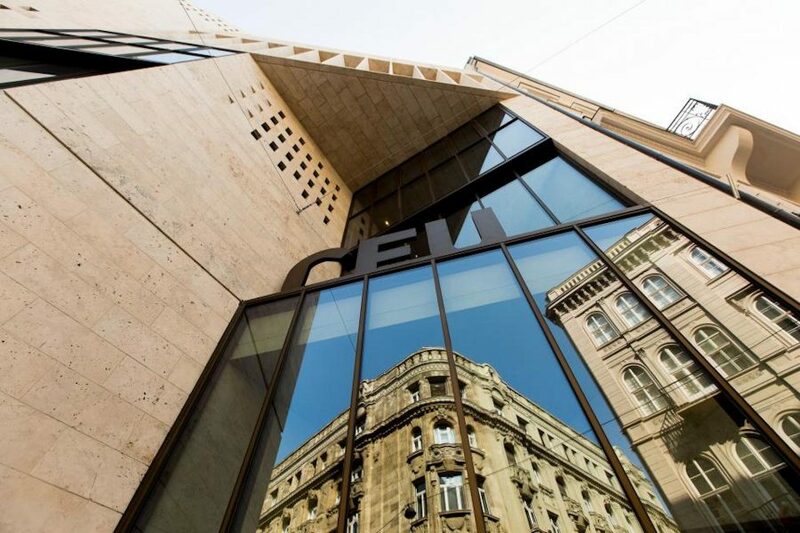 I have been in Budapest for just over three months now on an exchange at Central European University, and around me things are abuzz: next semester, CEU will move to Vienna as a direct result of the legal limbo in which the university has been caught for over a year by the current Hungarian government. (For some background on this issue, see Tanya Sharma’s article from last year or this webpage from CEU.) These pressures on the university and other educational institutions, including the cessation of funding of gender studies programs, are part of an unnerving pattern in which the current ruling party maintains its power through gerrymandering and restricting freedom of the press. I am unsure what this means for CEU, organizationally or bureaucratically; I don’t know what these things mean for Hungary as a nation; I am even more unsure what this means for the future of academic freedom at large. As someone who is neither a citizen of Hungary nor properly a student of CEU, I ask myself: How do I and should I interact with the space around me? Witnessing CEU’s preparation for its move and the activism gathering around it makes me wonder about this question, in this country to which I do not belong in any legal capacity, a country through which I am just passing. But something I do feel to be true: just as Hemingway’s Old Man claims to be ‘without politics’ as his world caves down around him, politically and personally, so too would claiming to be ‘without politics’ because of my international status be a gross irony. There are two ways to think of the narrator’s question: as a demand that the Old Man explain his political alignments (i.e. what leaders or parties the Old Man may support), or more abstractly (i.e. the Old Man as political by nature of his immediate circumstances, a matter of being in a specific place at a specific time). I don’t intend to compare the plight of CEU students with Spanish World War I victims; rather, I draw this comparison because there is an element of the political that is inherent and geographical regardless of explicit party alignment or citizenship status, as in the case of this Old Man, who is situated in the political, rather consciously acknowledging the political. In this sense, I understood the Old Man: beginning my semester at CEU, I felt that, given the legislative threats against the university launched in April of 2017, I would certainly be situated in the political, but that, due to my foreignness in the country, there would not necessarily be a conscious acknowledgement on my part (perhaps a naive sentiment, but it was how I felt). 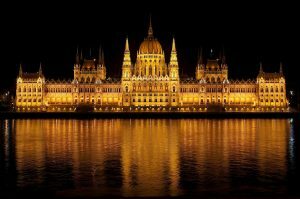 This changed dramatically with CEU’s recent announcement to move to Vienna; rather, I now felt that it would be unjust to remain “without politics.” To continue to align oneself ‘without politics’ only demonstrated that violations of academic freedom would also be permitted to continue unacknowledged. On a weekend trip to a small town east of Budapest, we encounter a vaguely authoritarian ticket-checker on the train. We realize we have neglected to buy a ticket for the dog traveling with us. The ticket checker’s moustache quivers with frustration. He flips back and forth between us and the next passengers a few times with a certain teasing quality, deciding whether or not to fine us. In the end, after concluding his drawn-out power trip, he decides to let us off of the hook, but only barely. In response, I would probably say something along the lines of what Jenny Holzer has written, that abuse of power comes as no surprise. This is true in the context of a frustrated train ticket checker just as in the context of a certain former Soros-scholarship recipient and current prime minister who seeks to limit academic freedom. But of course these two are very different situations. Students and activists occupied the square outside of the Parliament for a week, from November 24th until the following Saturday, December 1st. The first snow of the season happens while I am standing on the square. We all wear many layers, drink tea from multicolored plastic cups. 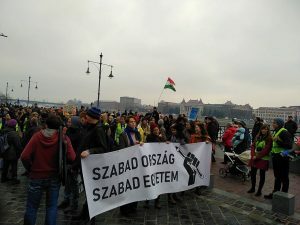 The occupation must be manned around the clock, so CEU students, students from other Hungarian universities, and activists stay there day in, day out. Lectures are given on the Parliament square during the day, both in English and Hungarian, as part of a “Free University” project. Sometimes, at night, there is dancing. I have felt particularly tender towards CEU during this week, moved by the compassion and intellectual dedication of the professors, many of whom taught their lessons in the cold Parliament square, and the open student body, who, driven by strong political and moral ideas, turn what could have otherwise been a series of bleak evenings in tents into a festive occasion for solidarity. I attend a dance class with a friend. It is taught in Hungarian; the theme is theatrical jazz. I haven’t done any sort of formal or structured dance in probably a decade but I try. When I take off my glasses the whole room goes fuzzy, and I attempt to repeat the gestures of the dancers in front of me, who now look like shapeless blobs. The teacher yells at me in the sharp yet well-intentioned way of dance teachers. Afterwards we walk home on Margaret Bridge; I am shivering and still sweating. Looking back onto the Buda side as we cross from one end to the other, lights cluster along the edges of the Danube. It’s kind of how I had always pictured continental Europe, but I can’t place why (fairy tales?). I am reminded of this scene when, at the occupation, someone comments that the Gothic-style Parliament structure is beautiful. It is, but at the same time we are standing outside of it for reasons that have nothing to do with beauty (or at least not beauty of the architectural variety). All the beauty — is it an awkward topic in such a serious moment, off-limits? 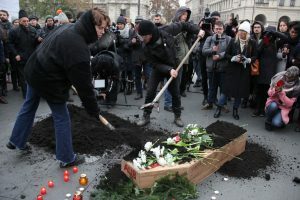 On the last day of the Parliament occupation, the final day on which there was a chance for a deal to be made with the Hungarian government in order for CEU to remain in Budapest, we bury a coffin that has the words ‘Academic Freedom’ emblazoned upon it. The ceremony takes the form of a funeral, and soil and flowers are thrown on top of the coffin. The atmosphere is somber, at least until we dance again. I like the way this shifts the argument from the idea of ‘making something happen’ as the only worthwhile outcome of political activism. Such a stance denies the very real and urgent need for assembly, communication — even in the cold, even when it seems like a lost cause, even when the lights on the Parliament shut off at midnight. This sentiment is not to imply that the cause of academic freedom or the cause of CEU remaining in Hungary is lost or that activism never ‘makes things happen’, but rather that the activism is important anyway, regardless of its direct and obvious consequences. My uncertainties of the political aside, I am grateful to have briefly made my way to this corner of the world, Budapest and CEU both. As I leave, so will CEU (give or take a semester). [*1] Hemingway, Ernest. The Complete Short Stories of Ernest Hemingway, 1987. Print. [*2] It is also worth noting that the anti-CEU campaign is part of the distrust and tension between the Hungarian government and Hungarian billionaire George Soros, founder of CEU. This distrust of George Soros has manifested in a variety of anti-semitic smear campaigns (for example, these posters and this series of anti-immigration laws).